Tomorrow I am running my first tournament. 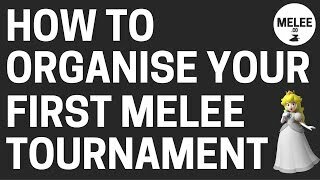 Here is details of how I organised my first melee tournament and how you can too. In this episode, I want to talk about how I organized my first tournament. Now, my first tournament is actually tonight, as I record this, so it has not happened yet. But I wanted to do is to talk through the things that I did in the lead up and the creation of this tournament in the hopes that it will inspire you guys to go out and to have the confidence to run your own tournament as well. So, the tournament tonight is a Tuesday night tournament, which weekends are generally ideal; however, this weekend one is up in Brisbane and I am on the Gold Coast in Queensland of Australia. And so there are a few weekends one is up there anyway, I can only really attend one weekend tournament a month so I want to be able to go to another tournament every single month. And so, basically I decided to create that myself on a Tuesday night. So, on the Gold Coast we have just a bit of background history – we have regular smashfest or meetups every Tuesday night anyway, on the Gold Coast. And what I have started doing in the last month is just running informal brackets at those meetups. So, we will set up a bracket on Challonge.com and we will run it through there. There is no money; it is really not for anything. It is just for a bit of fun and to bring some structure to the smashfest. So, the idea to actually run my own tournament – I started having that idea probably about a month ago or a little bit more than a month ago and I thought I would really like to run another tournament. And exactly as I was thinking about it – I think it was the next day, someone else from the Gold coast community announced that they are going to run the tournament on a weekend at the Gold Coast. At this point in time, there was only one tournament per month in Queensland running so we really needed something else. But as soon as this guy came in and decided to run his own tournament, I guess I got a bit nervy or I got a bit scared that people would not come maybe, and so I decided to cut it off. But anyway, the idea was in my mind and I wanted to do it and so I started talking to a friend of mine who also regularly attends these smashfests and talking to him about joint TO-ing – and TO stands for Tournament Organizer. So doing the TO-ing together basically so it was not all on my shoulders and I am really grateful to have him. But for those of you out there who do not have someone that you can bounce ideas off and get help with, this is definitely something that you could do yourself. So in order to set up the tournament, the first thing that you are going to need is a place to host the tournament. Now, we are really fortunate in that we got connected with some of the guys on the Gold Coast who play Street Fighter. These guys have been around as a community a little bit longer than us; they are a bit more organized than us. And so, they actually formed a relationship with a game store in our local area. And so this is a store that sells a whole bunch of different playing cards and things like that, like Magic the Gathering. That sort of stuff and they host – I think they host a whole bunch of nights, but on Tuesday night, the Street Fighter guys organized that we could come to the store and we could play at the store, in the back of the store. And so, they organized that. It has a $5 entry. That happened probably 6 months ago, almost or something like that; and so they had a relationship with the store anyway. So, we are fortunate enough to have a venue that we can host this tournament at. If you do not have a venue, that is going to be your first thing that you need to organize. Ideally, the cheapest way that you can do it is to do it at your own house or do it at someone’s house. If someone has a house, you could potentially just empty out the garage, deck out the garage with a bunch of CRTs and some camping chairs or something like that if you need to. Other affordable options are Unis. Often, people at Unis can book rooms for events and things like that so you could potentially do it through a university. You can also look into scout halls. I was looking into that originally when I was looking at hosting one of the weekends and that was, it was a bit over $100 to do it. So, depending on how much you charge for venue fee you can probably get most of that covered if not all of that covered. So, first thing you need to do is get a venue. As I said, we are very fortunate to have this game store. You can always approach the game stores in your local area and say here is what we want to do; we want to host this. Everyone who comes will pay a venue fee; for us, it was $5 venue fee to get in at the door. And then we are doing $5 to add to the pot as well. So, there are some ideas for getting a venue. I just talked to the guy who owns the venue. The Street Fighter guy had ran tournaments in the past so it was really easy for me. I just said ‘hey, we are looking at running a Melee tournament. Here is what we are thinking of doing; just $5 entry at the door. We will manage our own pot, extra entry into the pot.’ He said, “Yeah, cool. Go for it.” It is a Tuesday night anyway so we are running it anyway. So, once you have organized your venue. You then need to go about marketing your tournament. And this is – I just want to say, you do not need permission from anyone to run a tournament and that was something that I think held me back in the beginning. I was asking a bunch of people in the community ‘hey, if we run a tournament, what do you think?’ Trying to get buy in from people and to get affirmation and feel like getting permission from the community to run this tournament, but the fact is if a tournament is going to add to the value of your community then it is going to be something that people will absolutely love. And a lot of people do not want the responsibility to take over a tournament themselves so you do not need to wait for anyone’s permission to run a tournament. You can just simply set up the tournament; you can market it and hey, if no one turns up, you can just play Melee by yourself all day. Or if one person turns up, or two people turn up, or whatever it may be, so be it. Who cares? I do not know how many people are going to turn up tonight. I am guessing somewhere between 12 and 20 people. However, at regular Tuesday nights, some nights we get 3 to 4 people; other nights we get 10 plus people. The biggest night, I think, was a bit over 13 people. So, the worst case scenario, I think, would be that they would be 3 or 4 people there. But hey, if that happens I will run the tournament anyway. It is not really going to cost me a lot of money because there are just venue fee and pot entry, so it is not a big deal. However, if you are hiring your own venue and you had to pay $100 or $200 for a venue or something like that then you are going to need more people to sign up. But if it is at your house or at a venue like game shop we got organized, then it does not really matter how many people turn up for you. So, you do not need permission to run your own tournament. After you have the venue set up, you have decided on the date, you now need to market your tournament. Now in Australia, there is a whole bunch of different Facebook groups that are dedicated around Smash communities. There is a website, QLDSmash.com, which is basically Australia’s Smash website that we can list our events on as well. But mainly, the marketing of the event has really been through Facebook. So, I created an event on Facebook. I marketed it through the Facebook groups that I thought people might like to come; so there is Queensland Smash, there is Gold Coast Smash, and there is Queensland Smash events, and that was it. So create an event, market it to 3 Facebook groups. There is also a Slack group for some other people in Queensland who play Melee so people have been talking about it in there. But, I have not really actively marketed it in there so, in terms of marketing your event, really, just doing it through the Facebook groups that are already there, where people are already talking about Smash; that is the best way to do it. And so in the future, I may look into getting a MeetUp.com account or something like that to try and grow the community even more. But for now, I just do marketing through the Facebook group. So, you have your event, you have chosen your date, you have done some marketing for your event; you can do pre-registrations if you want. This is something that I have opted not to do because I do not think the turnout is going to be very big. And this might be a big mistake on my part. But in terms of getting people registered and running the bracket, you can use – there are a couple of free programs out there. There is Challonge.com, C-h-a-l-l-o-n-g-e.com. So that is free, you can sign up. The only thing is you need internet connection all night in order to run that. There is also one called TIO or something. You can google gaming bracket programs or something like that and you will find a bunch of programs out there. But you will need a program to run your bracket. Challonge is cool because you can set it up before. You can give people a registration link and they can go ahead and register before the event. I am not sure if other programs do that but if people just show up on the day as they pay you, you get their tag, you put it in, and it is going to create the bracket for you. And so, that is something else you need. You need to be able to run the bracket. You need to be there to collect the money and stuff, obviously. And then, I guess the last consideration you need is setups. Now, the best way to get set ups is to get the community to bring them and hopefully you have a community where people regularly bring setups. Again, we are quite fortunate. We have 2 permanent setups at this store. I have 2 setups myself and I am about to buy another CIT on the way to the event so I will have 3 TVs. There is another guy who usually brings a TV and the guy I am TOing with, he is going to bring a TV and someone else is bringing one as well so we will have like, 2, 5, maybe anywhere between 6 to 8 TVs for our events. So, the more TVs you can have the better because then your bracket can run faster and things like that. That is the last thing you need, setups, so you need CITs and then either Wiis with 20xx or something on there or GameCubes with Melee. And so, the best way that I found to do that is to just message people through Facebook Messenger and just request that they bring their setup that night. I now that some TOs give people discounts if they bring CITs and things like that. I am running a small event so it is not something that I need to do. A lot of people in the community are willing to help out in order to make things run. Actually, there is a small portion of people who are happy to help out. But you only need a small portion to bring TVs for the event to run. Basically, you will need 1 in 3 people probably to bring a TV for the event to run; or if you bring in 2 TVs yourself then obviously you will need less people. So, that is basically start-to-finish how I organized my first tournament. I guess the biggest takeaway is you do not need permission to get started. You can just go ahead and do it. You can market it. If people turn up, great; if people choose not to turn up, well maybe you need to do something different next time, improve your marketing or something like that. Talk to the community; maybe pick a different day or something like that. But you do not need permission in order to create your tournament. Then, you need to get your venue organized as a first thing. Set your date. You then need to market the event through Facebook groups or whatever. You need some sort of program to run your bracket like Challonge.com and you need to collect money on the night and you need CITs and setups in order to run the event. And so, that is how I organized my first tournament. I will do another update tomorrow and will let you guys know how the tournament went. And hopefully this is going to become a monthly occurrence for the Gold Coast where I run a tournament on Tuesday nights, once very single month and hopefully it is going to help grow the community. Bring more players in and just a whole bunch of fun. So, that is it for me guys. Until next time, keep calm and play Melee.